With Windows 8, Microsoft is reimagining the most basic premises of personal computers. CEO Steve Ballmer recognizes the drastic changes coming in Windows 8, even calling the platform one of the biggest risks taken by the industry giant. The UI changes and fundamental paradigm shifts that Windows 8 brings to the table are making a lot of power users eager to give the platform a trial run, even in its current state as a Developer Preview. If you want to take the plunge and give Windows 8 a try, there are some things you should know ahead of time. 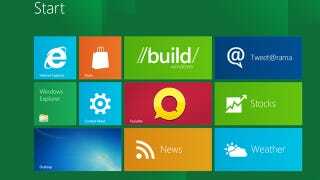 First, the current build of Windows 8 is intended as a Developer Preview. This is pre-beta software, meaning there will be bugs and even major missing features. We don't recommend installing Windows 8 as your primary system, but we do encourage you to take it for a spin and spend some time tinkering under the hood. And we recommend that you use good backup practices for any data you put on your Windows 8 system, as stability may be an issue. Whenever you are looking to install new software, especially a new operating system, your first step should be to review the system requirements. Fortunately, the system requirements for Windows 8 are identical to those for Windows 7. In fact, a baseline Windows 8 installation will consume fewer system resources than a baseline Windows 7 SP1 build. So if you're already running Windows 7, you're in good shape. Note, however, that there are special requirements for touch input. Microsoft has provided both 32-bit and 64-bit versions of the Windows 8 Developer Preview installation media, both freely available from MSDN. For best results, you should verify that your media downloaded correctly using the hash provided by Microsoft. The .iso files provided can be easily burned to a DVD using native tools in Windows 7 or your preferred DVD software. There are a couple of different decisions that must be made before you begin any OS install. The first is whether you want the OS to coexist with another in a dual-boot scenario or if you are simply going to overwrite any existing OS installs. Dual-booting provides you with some flexibility to fall back to an existing platform, but also adds complexity in terms of drive partitioning. The other decision is the method of installation. The typical method for installing an operating system is using a bootable disc, which gives you the ability to install the Windows 8 OS to a second hard drive or partition. The Windows 8 Developer Preview will also allow you to install from within a previous Windows version, providing you the option to retain accounts, files, and settings (if installing from Vista or Windows 7). We'll walk you through both options. The most common method for installing a new operating system on your computer is to boot from a setup disc, in this case a DVD. After inserting the disc and choosing to boot from your optical drive, the Windows 8 setup wizard will look very similar to the Windows 7 install. The first screen prompts you to enter your location information in order to configure your keyboard and other locale-specific settings (image above), and the second contains the button to actually begin the installation. As with most Windows installations, Windows 8 displays Upgrade or Custom (advanced) options. One of the key differences in using the boot-disc installation is that the Upgrade choice is actually a dead-end. To upgrade from a previous install of Windows, you'll need to use the Windows-based setup utility.The next step in this exercise is choosing the drive or partition for your Windows 8 install (image above). As with Windows 7, you have the option to use empty drive space, reformat an existing partition, or install over an existing Windows instance. If you choose the latter option, system and user files will be placed in the Windows.old directory to be accessed later. Choose your option and hit next-the installer will take over from there. Using the Setup option from within a previous version of Windows is a relatively simple prospect. After inserting the setup disc, the installer will ask if you'd like to get updates to the installer itself, which is a nice benefit (image below). You'll be asked a couple of simple questions-click the Install button at the end and setup will proceed. Once installation is complete, you will be prompted to configure Windows 8 for the first time. Once you've successfully completed the install of the Windows 8 Developer Preview, there are still some configuration steps to take before you can start playing around with the system (image below). If you're the impatient type, the "Use express settings" button is your shortcut to the end result. We recommend choosing the Customize option, which allows you to step through each setting and verify that your machine is configured perfectly. Assuming you chose the Customize button, the next screen you see asks for your sharing settings-basically, whether you want to share files or devices with other computers on your network. The next screen allows you to configure settings for automatic updates and system protection tools like SmartScreen Filter in Internet Explorer. The rest of the configuration process is fairly self-explanatory. Now that the system is configured, it's time to get your account set up. There are a couple of options at this point that require some attention. Windows 8 will allow you to use local computer accounts, just like prior versions of Windows, or you can log in with your Windows Live account (image above). Using the Windows Live option will give you some additional features, like the ability to synchronize files and settings between multiple Windows 8 computers. If you used the Windows-based setup and selected the option to retain your user account information, you will be required to enter your old password in order to complete that process. Associating your existing account with Windows Live is completely optional, but if you forgo this choice you will miss out on some of the key new functionality in Windows 8. Now that you've successfully navigated the installation process, it's time to play with the shiny new Metro UI. Resist the urge to jump straight to the Windows Desktop-Metro is the future of Windows (image below). Though the UI is designed to be extremely touch friendly, Microsoft has made an effort to make it usable for users with a mouse and keyboard, as well. You can activate Metro apps with a mouse click, rearrange tiles by clicking and dragging, and search by simply typing a word or phrase. There are a few common gestures you should become familiar with. Placing your mouse in the bottom‑left corner of the screen will access the "Charm" menu (image below), which gives you quick access to Search, Settings, and Sharing. Placing your mouse on the far left edge of the screen will bring up a thumbnail of the last app you used. Clicking this thumbnail will return you to the app. OK, the training wheels are off and you're on your own. Enjoy the ride!